Here are some resources that are available online, either via this website or others. 1) There is a very fine video that was done by Mr. Ed Sirois for his school community. 2) A small booklet – currently out of print – is available as a PDF. 3) Further online information and links may be found at Wikipedia, WikiVisually, the website in Rome, and other places. 4) Various kinds of artwork are collected on this Google Photos album and at this link on the LRC website..
5) His story is included is a small PDF booklet about all the Lasallian saints. 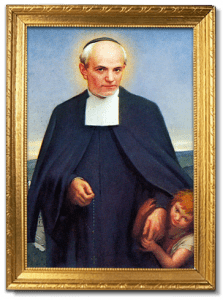 6) The Motherhouse in Rome has provided a PDF with the liturgical (Mass) readings and prayers for this Lasallian feast, and a webpage that includes his short biography, a few links, and a video. 5) There are devotional medals and the like available online. Louis proved neither physically nor emotionally suited to his father’s trade; he was convinced that the Lord was calling him to a different kind of forge. No sooner had he met the Brothers in a nearby school than he determined to enter the novitiate at Namur. After two years, teaching elementary classes, Brother Mutien was assigned to the boarding school at Malonne where he would spend the next fifty-eight years. He had difficulties at first coping with the demands of both teaching and prefecting. He was rescued by the Brother in charge of the courses in music and art, at the time an important feature of the curriculum. From then on Brother Mutien was not only an effective teacher of those subjects, a vigilant prefect in the school yard, and a catechist in the nearby parish, but a tremendous influence on the students by his patience and evident piety.